My last two 'modern' gas cookers also plug into the electricity for the timer clock. As a 'safety feature' the gas doesn't light if the electricity is off. I tried not to buy one like this again after getting caught out the first time, but couldn't find a decent, double oven gas cooker that wasn't this type. tried to buy a stove without electric ignition. was told no longer made in usa. said to be fuel saver, more like condemn you to freeze to death even with gas piped in to the house. can light stove top with matches, of which i have a goodly supply. have enough on hand that we would only go without fresh veg in a power cut, but how to keep the pipes from freezing? Spade and Dagger - is it because the ovens are fan assisted? It's shame when things get too modern, like electric windows on a car, in my mind it's just something else to go wrong! Deborah Harvey - A gas stove is a good way to cook - I wish we had gas here, I miss it from our last house, it really was the way to cook. Our electric hob is useless. No, the ovens don't have fans - they are just basic ones (we like basic too!!). Unfortunately without the electricity, the gas burners can't be used even with a match. Nice post. When I was a child growing up in small villages it was the norm to get snowed in. 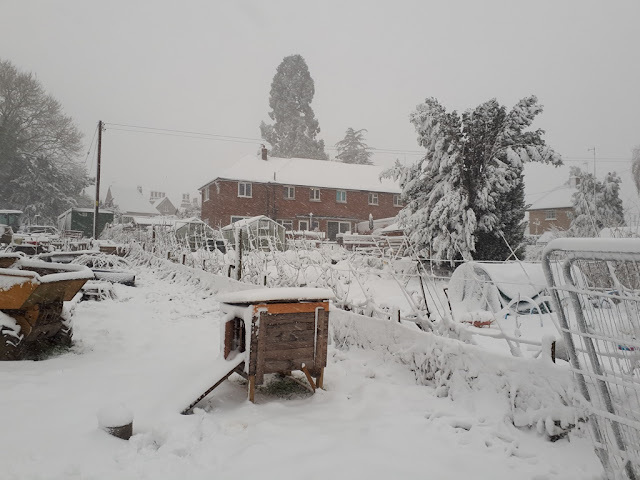 So come winter you always made sure you had enough wood and coal and a good stock of food as you never knew how long you were going to be snowed in for. It was part of the standard preparations for winter (well at least it was in our family). Can you remember the power cuts. I can and you make do as best as you can and with what you have. There is always a means and a way and our family too has always kept the base stock of ingredients in so that you can set too and make something if needs be and feed yourself and keep yourselves warm. A big advantage is always a working fire place or log burner at least you can keep everyone warm that way. We used to have lots of power cuts as children. In later years dad had a generator rigged up so life just carried on as normal, for us at least! A change over switch by the fuse board would be thrown. The only trouble was we didn't know when the grid came back on! Great post Kev. People don't prepare as you have identified, we love the idea of getting snowed in, however they are quite happy to stock two trolleys full of Christmas supplies as if they shops don't open between Christmas and New Year! And yes I made sure we had flour and yeast, admit to forgetting the extra milk but hot chocolate doesn't need it and I drink my coffee black mostly so we'll manage. tins of evaporated milk. good in coffee if you develop a taste for it. i like it. and the tins keep well. can be used in pumpkin pie when restocking before use-by date. Getting snowed in makes everything harder but we could stay like this for a while without being uncomfortable. Milk is our limiting factor, mainly due to how much the children drink. they could go without though, it wouldn't hurt them, we keep powdered yogurt anyway so there's plenty of dairy! I can't have milk anymore, it's a shame as I love evaporated milk, used to have it on everything! I love getting snowed in, like you I am prepared, well actually I'm prepared all year round, never mind the snow! Our only problem is that we normally get a power cut with it, that's fine, but our telephone won't work, central heating goes off and we don't have a mobile signal either so we're stumped. We have a camping stove, coal and wood for the fire so we're alright. And then I get the x-country skis out and have fun! People are such wimps in the UK, one flake of snow and they have a nervous breakdown! This has been great with no power cut, I've got loads done for the extension. I've been making doors and loving my time in the workshop! We basically have enough everything for few weeks. House can be kept warm with wood (four fireplaces), and I have two wood-burning stoves to cook, one has cooker lid and oven (and we have a camping stove and a gas grill AND fuel for both!). We can get firewood from our own forest, we have a year supply dry wood at storage. We get water from our own well, and if there is no electricity, we have a clean bucket and a rope to fetch water (no manual pump, I'm planning to renovate the well and then I'm going to buy a manual pump). We have a composting toilet (outhouse). We have basic medical supplies. We have flashlights and batteries for them. Food - I have few weeks supply of food like tins, flour, rice, pulses, oats, pasta, jams, sugar, salt, spices. Fridge has some milk, veggies, ketchup etc. Major problem is my freezers - I have two freezers full of food (meat, fish, bread, ready made meals). Without power they start to go off in 24-48 hrs. What we might run out first is cat food, they just have to settle for minced meat from freezer. Sounds like I'm prepairing for the next ice age? But there has been winters we have been without electricity for up to two weeks (with temperatures below -20 celsius), and there has been times when roads have been unusable for days (there is only two roads away from our village). suggest a second generator when funds permit since a breakdown of the one you have is possible, and enough fuel for the genny so that your freezers can be kept cold. read about someone in idaho who has an old freezer on the back porch [north side]. when power went out they put their freezer contents into the one on the back porch and propped it open a small bit. plenty of arctic air to keep it frozen. when power was restored they moved things back to the indoor freezer, taking the opportunity to cull the contents and reorganize them. Ulvmor -this doesn't sound excessive at all. Good sense if you ask me. Water is something we are way behind on here, next door have a well though and I know we could use that. I have different ways of making it safe. Deborah Harvey - I have a little generator that I could use for freezers but I could do with somethign a bit bigger that could run the house really. Cost and somewhere to store it are what's holding me back! yeah really....bake a loaf of bread. it's not rocket science right? 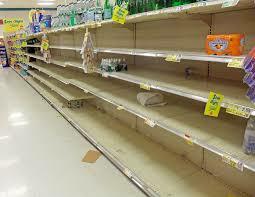 i can never figure why it takes snow in the forecast to make people stock up on food.i wish we had your snow. we rarely get snow here anymore. we used to get tons of it back in the early 90's but not since. global warming i guess? i bet your kids liked it! I think people even forget what bread is made from to be honest! We don't get much snow these days. First time like this is a number of years. I live in rural Ireland. We have three stoves, two of them multi fuel and one with an oven, with our own water supply okay it needs electric to pump it out - but in case of a power cut, then there is a holding tank of sixty gallons as a back up and one outside of two hundred. A supply of dried foods with flour - you actually don't need yeast or even soda to make a form of bread. I learned that when I was a scout that flour with a drop of water will make paste which can be baked. Yeah, I've made that type of bread many times when camping, we call it banock bread, add some rasins and it's lovely! We have a few tins of yeast here though, I like it fluffy! We're fine in snowed in situations, there is always the makings of food in the kitchen cupboards. I take my coffee black and Alan doesn't mind his tea black if we run out of milk. As you say we have 'emergency cake, and 'long life bread' and homemade jam to spread on them. The only thing we don't like is the solar panels not getting any light when they are covered in snow, but we can run off the mains and if they should fail use our solar battery back up system, and we could always get on the garage roof and brush the snow off the panels if push came to shove, and we would do this if the mains electric went off to recharge our batteries. I find the sudden panic buying very amusing. The only downside in this country now is that supermarkets all get their daily supplies delivered overnight and have little, if any storage facilities. So a little bit of panic buying clears the decks very quickly. The panic also amuses me, I think the newspapers are to blame some what. If they dedicated the same space to educating people how to prepare for these storms rather than selling on a fear mongering headline we'd all be better off. We have wood and a wood burner, plus a camping stove and kettle. Once things are cooking, a thermal cooking bag to finish it off without any more fuel being used. Candles, oil lamps and hot water bottles. Loads of blankets and enough food for at least a week of easy meals, soups, breakfasts etc. Lost my camping stove a few years ago (left it on a job I quit) so need to get another. I also want to get an oil lamp, be a handy thing to keep. you;ve mentioned the thermal cooking bag before, I'm going to have to look into that. If you ever move to the United States, don't settle in California. Ha! Not much chance of me moving at the moment! We're very settled! This is a great post! A bit of bad weather isn’t a problem for me. I find it interesting to watch how different people cope with it. When I bought my house I thought about how we could cope in a fuel crisis. We have gas electric and a log burner. If people run out of bread they could try making some? I have a uht pack of milk just in case. Be prepared is a good motto. Thanks! Yeah UHT or Soya have a good shelf life and last over a year, doesn't cost much to keep them in stock, as for bread it's almost like people forget it only has four ingredients! We're the same, big bags of everything. I haven't got any potatoes at the moment and that's an oversight. I normally buy 75kg at a time, just been putting it off! There's plenty else to eat though! i have a big 4WD but no intentions of moving it unless I have to! We are always stocked up as I have a bit of a wartime mentality. I really don't understand how someone can blame a supermarket cashier for the bread running out, but unfortunately we seem to live in a 'nanny' state now, where some people seem unable to take responsibility for themselves and their welfare. We certainly live in a time where it's easier to blame someone else. People need to take control of their own lives, there's only one person to blame if you run out of food in a week! We keep fairly stocked but I could do a lot more and need to look at everything once this snow has past. I have also thought about keeping some of those part baked rolls. I am thinking how you could cook them in a wood stove. or on top of it with a dutch oven or casserole on top. There must be a way. We have the gas BBQ I can bake in that if I needed to. Maybe this is the chance to say about building a super duper wood fired outdoor pizza oven. a la Jamie Oliver. The blog the greening of gavin has step by step how to make one yourself. They retail for about £3k! you know me, we would be ok! Wait for the sales Kev and get a camping stove then and a kelly kettle! we love our kelly kettle, couple of twigs and some leaves and you have boiled water just like that! Worth the money to us as we use it camping and when travelling. I have seen them for about £35 in a good sale. Kevin, you are morphing into a survivalist! You make sense, but there will always be sheeple who expect someone else to take responsibility for their welfare. People can idiotic! I don't understand but we chose to put a wood burner in that is connected to our hot water so if we loose power with heat and hot water. It is a late of common sense and people feeling sorry for themselves. We just hunkered down, checked on neighbours and enjoyed card making and snacks from the freezer. We also have long life soup, it's called frozen veg and stock cube with funny stuff called water it comes out of a tap! That last sentence says it all. Love it.